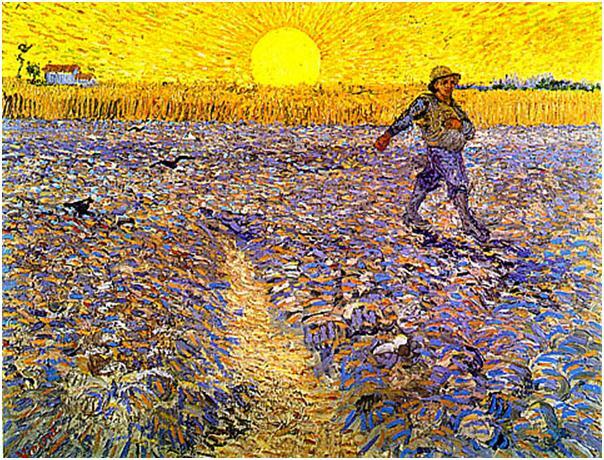 We see Jesus tell a parable, much like an illustration or example, about someone sowing seeds. Some seeds he sows feel on path and birds carried them off. Others on ground that was rocky, they sprouted up and then without depth, withered. Others among thorns and they choked them off. And finally some seed fell on good ground and brought forth lots of yield. In verses 13-20 Jesus explains to us what exactly is happening here. I think for us the thing that we need to notice about all these scenario is that in each of them, the seed lands upon the ground, and in some cases begins to show some growth. But then something happens. Either birds (Satan) take them, or the lack of depth, or the thorns, cause them from fully blossoming. The seed is that faith, that grace of God given to us. Grace is not just given to Christians, but through prevenient grace, grace is show to all. All people, even those that reject God, as shown His goodness. The bible says that all good gifts from God, so if it’s in your life, and it’s good, it’s from God. First, we aren’t able to even process we’ve been given it. Spiritual warfare, distractions, things come against us and before we can even process that we’ve been given grace, we’ve moved on. So, in other words, pay attention to God’s grace given you. Second, it is received and it is good. But, there is no depth. And trials come. Troubles come. And it dies on the vine. So, it isn’t just enough to “believe” and get excited about Jesus. We’ve got to get deep roots. Faith isn’t just a matter or excitement of joy. We need discipline. Because it’s going to be hard at times. There’s going to be challenges at times. There’s going to be troubles. If we don’t have those roots we will fade. How do we develop roots? We attend to things of God. We read. We pray. We stay connected to God’s people. The way I put it is we read our Bible, we pray, we go to church. Faithfully doing these things give us roots to survive troubles. And the third thing we see is the seed is sown and thorns choke them off. The concerns of the world draw our focus from God, to the world. Stay focused. Remember what matters. Focus on what counts. Keep your mind on the things of God in all things. And last we see ground that is receptive, that is good, that is ready. Good dirt. That’s what we want to be. Receptive to God’s word and focused on seeing it grow when it’s given to us. Today may we be good dirt! Tomorrow we’ll look at Mark 4:21-32.